New Balance's marketing pitch: Takes the science of soft to a new level with smooth, consistent cushioning. 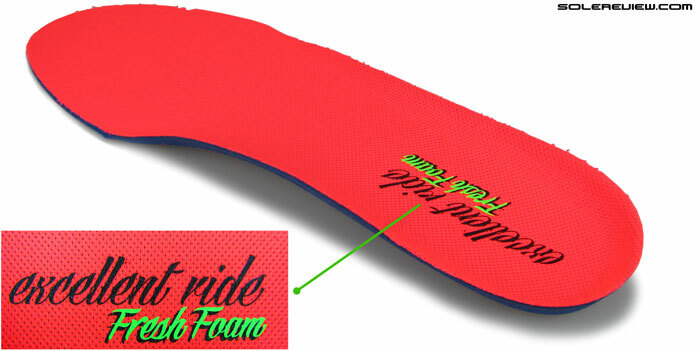 Outsole: Soft blown rubber, harder rubber used in heel crash pad. This is the shoe which the original 980 should have been in the first place. Cushioning and ride comes with noticeable improvements. The latest Fresh Foam installment brings in renewed softness after an underwhelming slow start last year. New Balance carved out its own take on the category of cushioned, low heel drop running shoes just last year, and boy, things are evolving fast. 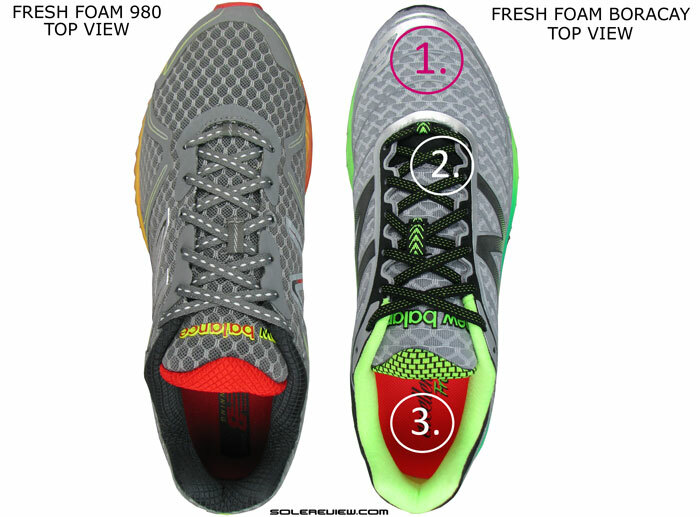 The original Fresh Foam 980 was a wholesome shoe which got a lot of things right, yet a little disappointing in context of the whole ‘science of soft’ marketing campaign. But one of a brand’s biggest strengths is quickly learning from minor setbacks, and in that light, the East coast based brand comes across as a shining standard bearer. 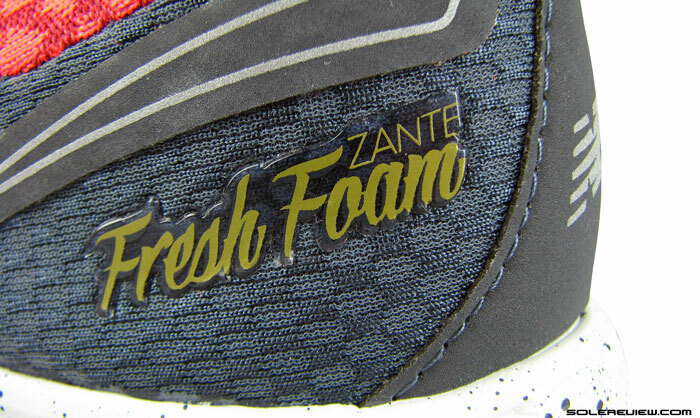 The superlative Zante gave everyone a preview of the Fresh Foam evolution. The very excellent Fresh Foam Zante made its debut at the New York marathon, and continues to win praise from many quarters, including from yours truly. The midsole foam felt soft but not mushy, and delivered a smooth and responsive ride served up in a lightweight package. And capable of wearing multiple hats, be it that of a cushioned daily trainer or a tempo companion. What was great on the Zante transfers to on the Boracay too, aka 980 v2. 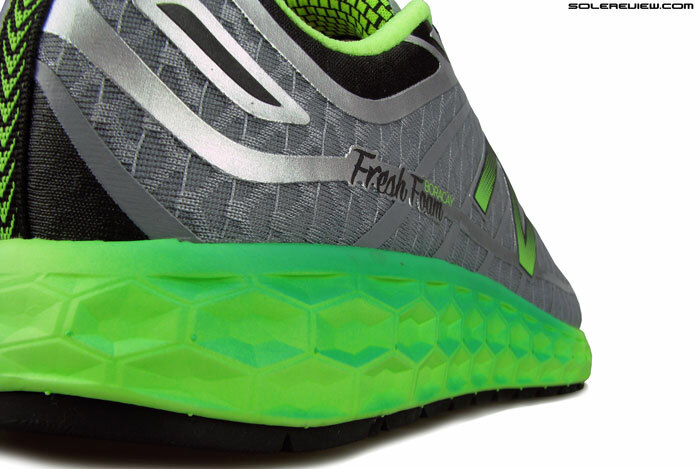 Given our positive experience with the new iteration of Fresh Foam, we were eager to try the second version of the Fresh Foam 980, or in present day parlance, the Fresh Foam Boracay. We really don’t want you to scroll to the end of our review to know what we think of the new 980, so we’ll bring up the lowdown upfront. New Balance gets Fresh Foam right in its second try. 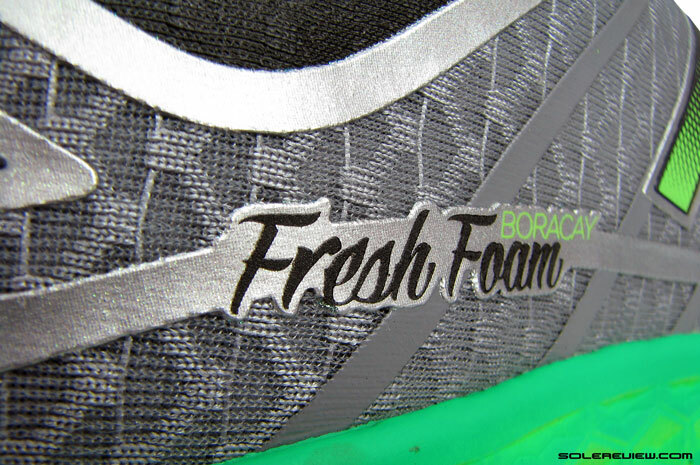 The 2015 Fresh Foam Boracay is the shoe which the original 2014 980 should have been. The Boracay’s ride behavior is better aligned with the much tom-tommed ‘Science of soft’ punchline, at a far more relatable level than the 980 V1. The 4 mm heel drop trainer works nicely when paired with the Zante; the latter being a more tempo focused lightweight trainer, while the Boracay is suitable as a comfortable shoe meant to chew up intergalactic mileage. Even with softness cranked upwards, a Hoka beater this shoe is most certainly not. What we like about the Zante and Boracay is that these shoes aren’t trying to take the fight to any other brand. The Fresh Foam line is not about extreme softness and pillowy plush; it is about striking a fine balance between cushioning and efficiency of ride. Go a bit firm, and you end up with the 980 v1. Pump in too much softness, and you might well be running on a midsole made of syrup, which will surely cramp your pace. The art is to master the delicate balance, and the 2015 Boracay shows great promise within that framework. The ‘science of soft’ might be misinterpreted by some Fresh Foam first-timers, so it is important to understand the equilibrium which the Fresh Foam assortment tries to bring to the party. Most would have noticed that New Balance is now calling its shoes by names rather than numbers, and the Zante and Boracay are the earliest adopters of that change. Behind the scenes, however, they are still known by the numbers, as the tongue labels for both the models seem to suggest. In numeric terms, the Boracay is 980 V2, and the Zante is 1980M. But as far as consumer facing nomenclature is concerned, the numbers are given a go-around, and in their place comes names inspired by the idyllic islands of Greece (Zante) and Philippines (Boracay). The Boracay is the rightful heir to the spot which the 980 vacates, and while it shares a similar silhouette, the changes which runs through are pretty significant. There are no exact carryover parts from the 980, and that signals New Balance’s serious effort to inject complete freshness into the newest version. 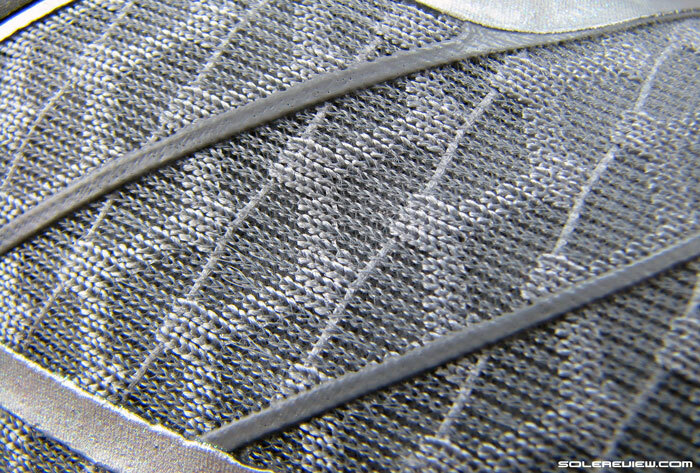 Synthetic leather overlays of the 980 v1 – gone. High density printing is the new act in town. The base layer – tonal grey strips fused over a closed structure mesh. New Balance has a new design take on the upper, which cuts out the use of no-sew synthetic leather panels and embraces high density printing in lieu. The result is a more fluid looking design, with stitch-less lines seamlessly mapping the surface. There’s a combination of two printed layers; the first being tonal grey lines, with a second metallic layer which fills in for visual detailing and structural support. Very chromy, shiny and all, but no reflect-y in darkness. On the reviewed colorway of Grey and Neon, the snaking upper layers were all chromed up in glossy silver. No part of that is truly reflective, by the way. Just manages to pull a daytime shiny effect, that’s all. That makes the Boracay completely non-reflective in low light visibility. Not a step-down from the 980 in any way, but would have been nice to see a few slivers of shine-at-night’s here and there. The semi-elastic laces sit a bit higher this time, with overall narrow lacing. The eyelet panel is layered over with the fused material. 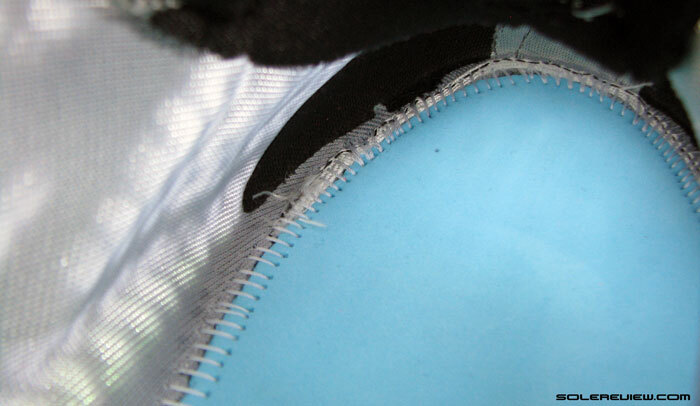 The individual eyelets are separated by grooves, and overall the entire lacing becomes narrower than the outgoing 980. The laces are flat but differ from last year by becoming slightly elastic. This bodes well for cinching, but ultimately converts into a longer portion of leftover length. One can go around that minor issue by tying larger loops or using double lacing techniques. 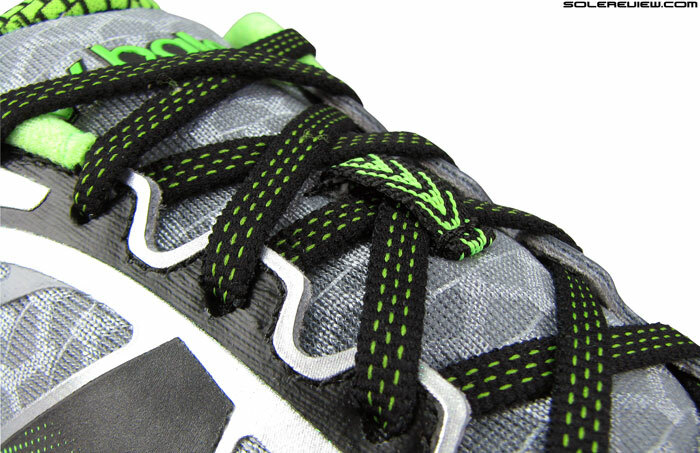 Utilizing the last row of lacing will also help shorten length, and don’t worry about running out of tongue flap. The elastic gusset in the front allows the tongue to go slightly longer – more on that below. Like the 980 and unlike the Zante, the Boracay’s tongue has no gusset attachment. Expect a minor amount of slide during and after runs. The tongue construction is standard type with no sleeving, and its position changes between the time you first lace the shoe to when you take it off after a 5 miler. The tongue loop stops excessive sideways shifting in nick of time, yet you can’t seem to escape a small degree of tongue slide. This part is new vs. the 980. 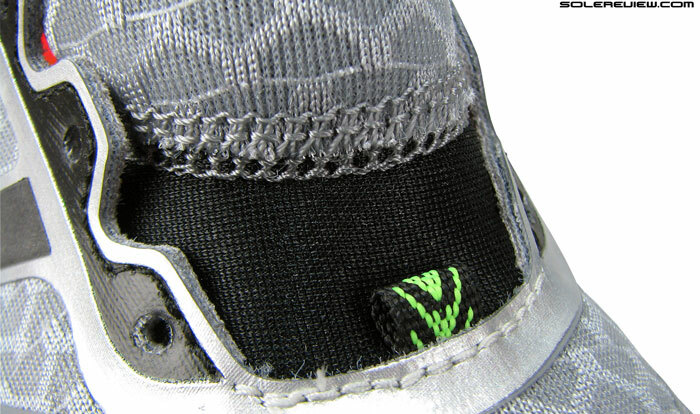 A piece of elastic connector between the forefoot and tongue. A couple of noticeable updates on the tongue would be the upholstery of the top flap, which is smoother than before, and the addition of an elastic which joins the forefoot with rest of the tongue. This is new on the Fresh Foam, but is an old New Balance design trick, used in many shoes including the 1260, 860 and the 1080. It is supposed to result in a better fit over the foot, though in this specific case, it runs slightly counter intuitive. We’ll cover that in our fit discussion. The mesh has been updated, a close surface textured type with the minute amounts of squish in it. 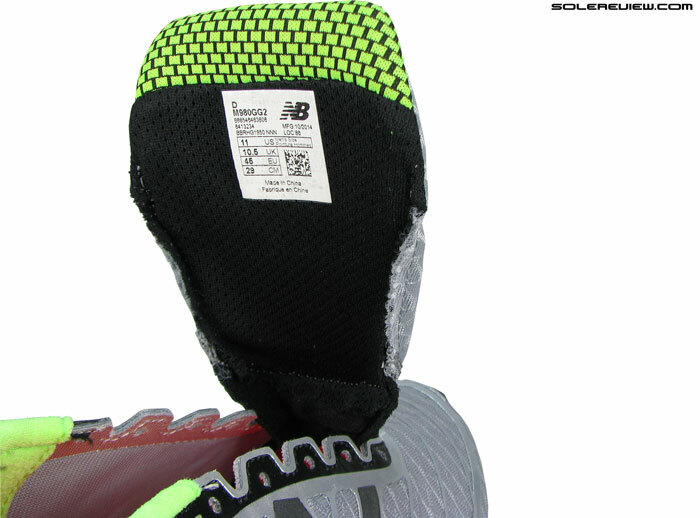 For some reason, New Balance says that the upper uses a 2-way stretch mesh, but we found that it isn’t really so. The mesh is no more or less elastic than the original 980’s, which was pretty flat and static. The interior has no lining, which makes the upper mesh fairly breathable, capable of letting air in and out. Upper layer of the tongue is made of the same new mesh, with the reverse lining being the perforated fabric seen on the 980 v1. Smoother and softer than last year. The collar, that is. The collar area is lusher than before, with softer dressing wrapping the foam beneath. Similar to the lining textile used on the Zante, but not identical. But unlike the Zante’s semi-collapsible heel, the Boracay uses a full sized internal counter for structural rigidity. Same as the 980 v1, then. If you take into account the fact that the midsole and outsole hasn’t changed, the Boracay should be lighter, correct? Yes, but the weight change is small, and the Boracay only sheds a microscopical amount of flab. Speak of it in precise terms, and that’s 6 grams or 0.2 Oz lighter than the synthetic leather clothed Fresh Foam 980. Not much, and certainly not noticeable. But sub-10 oz for a size US 11 is respectable for a proper running shoe with all the bells and whistles, so there’s no complaining here. Fit is not very different from the New Balance 980. But very perceptive ladies and gents will feel four subtle changes, and that realization will come quickly if the previous 980 has been with you for a better part of the last few months. 1) Slightly wider toe tip than 980 2) Lower top down lacing pressure 3) Collar snugness kicks up a notch. The first change will be felt right around the tip, where the Boracay provides more medial toe-box room. It has more to do with design update on the outsole than the upper, really. The outsole lip – the foremost part which overlays and glues over the toe box – is wider than the 980, and that helps broaden up the area. It is also worth noting that the Boracay does not really have an external toe bumper, a duty previously performed by a synthetic overlay on the 980. Inside, the Boracay does have a toe-puff, but assuming that its thickness is slightly lower than 980’s synthetic bumper, that could be another reason why the medial toe box feels more spacious. As far as toe box height is concerned both shoes are tied equally, and sizing fits true. Secondly, medial forefoot over the small toe feels freer, as the upper is literally unburdened of bulky overlays. The high density printing is less restrictive than the 980’s synthetic, and one will feel minor change in fit around that area. Third, with the powers-that-be at New Balance deciding to tinker with the eye stay area, the level of lacing pressure subsides a notch or two. The eyelet panel on the 980 v1 was pretty thin, which allowed the laces to stretch over in a fashion which was near flush with the tongue. The Boracay’s panel is designed differently, and not only is it thicker, but also brings opposing eyelet holes closer. So the lacing sits relatively elevated than the 980, and either sides of the panel come closer. By now, you’d have figured out that all of this brings down lacing pressure, and that’s exactly what happens. And lastly, the upper heel is molded with lesser outwards splay (see comparative top view picture) than last year, influencing the quality of collar fit around the foot. Comes across as little more snugger when it comes to holding the foot in place. All said and done, the Boracay has a comfortable upper fit, and more relaxed than the Zante. The midfoot is nowhere close to the Zante, which came with a super snug mid and forefoot fit, not to mention a lower profile toe-box. The Boracay upper is very comfortable in D width, snug but not unduly so, and there’s a consistency of lockdown which many will appreciate. It won’t win any medals when it comes to plushness, but hey, this isn’t the shoe to expect that from. The upper mesh feels smooth inside, and there’s reasonable amount of foam padding pocketed inside the tongue and collar walls. If there’s anything to be improved, that’ll be the tongue. A couple of areas, one which concerns the dimensions, and another which is about the construction. The tongue of the 980 and Boracay is narrow across and that presents a problem. When you pull the tongue towards you when getting inside the shoe, the edges tend to curl over. So you have to reach in with your index finger and straighten the pesky edges out. The same edges feel scratchy when the Boracay is worn minus socks, and makes the inner fit fairly uncomfortable. 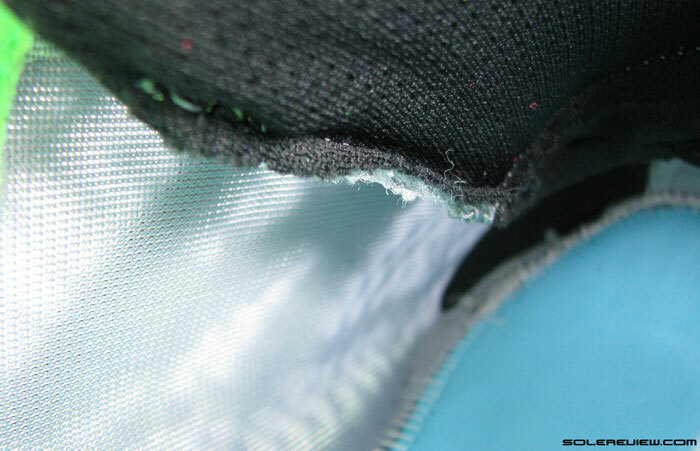 Would have been far better if New Balance had used a softer material, or used a different construction technique to close the seams out. At first glance , the sole design doesn’t seem like it’s gone through much change. But like many things, it is what one doesn’t see which makes the new Fresh Foam Boracay different from its past self. Most people who’ve worn the first generation 980 might guess what the change focuses on. Everyone seemed to unanimously agree that the 980 ran firmer than what it should have, given the ‘Science of soft’ spin. So that’s what this shoe’s evolution amounts to – an increased level of softness right from the insole to the entire bulk of the midsole. The 980 felt layered in its ride. Which meant that its plush insole did a great job at delivering instant cushioning underfoot, but that did not necessarily percolate down to the fancifully sculptured midsole. 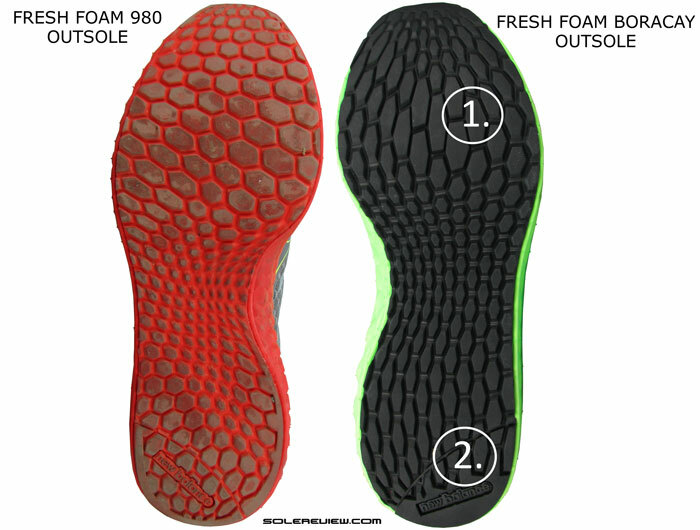 Footstrikes on the 980 felt going through distinct densities of foam; soft at first, then a thicker layer of firmness. That isn’t the case in the new Boracay. The midsole is softer than the 980, and so is the Ortholite insole. At first, we weren’t sure about the insole part. But when comparing our pairs of the 980 and Boracay, the new sockliner was softer, and marginally thinner too. Maybe slimmer by around 2 mm. Now both the softness and thickness could be manufacturing consistency, but based on what we found, we have to give New Balance the benefit of doubt. Softer and thinner is good, because it gives greater and faster access to the actual midsole during the gait cycle. The feedback is clearer and more honest, for a lack of a better word. Somewhat similar to the Zante, where a thin footbed allowed us to feel the cushioned midsole for what it really was. When we say that the midsole softness is increased, this doesn’t mean that the Boracay now becomes a Hoka Clifton rival. There’s a tinge of firmness in the whole affair, as if the foam compression is controlled and measured. This is what we meant when we said that Boracay tiptoes the line between too soft and too firm quite well. Visually, the midsole maintains a familiar feel, with hexagonally shaped projections (medial heel) and shallow cavities (lateral side and medial forefoot) stamped into its sidewalls. When viewed from the side, the Boracay also looks slightly lower profile, as the rim of the midsole is lowered down a little. Can’t say whether that has affected stack heights, as we don’t have a way of accurately measuring thickness, short of destroying the shoe. 1) Lugs change from regular hexagons to elongated shapes, and the midfoot waist in center is wider 2) Same separate heel crash pad as the 980. Outsole stays the same fundamentally with a full ground contact blown rubber sheet, save for a couple of changes. 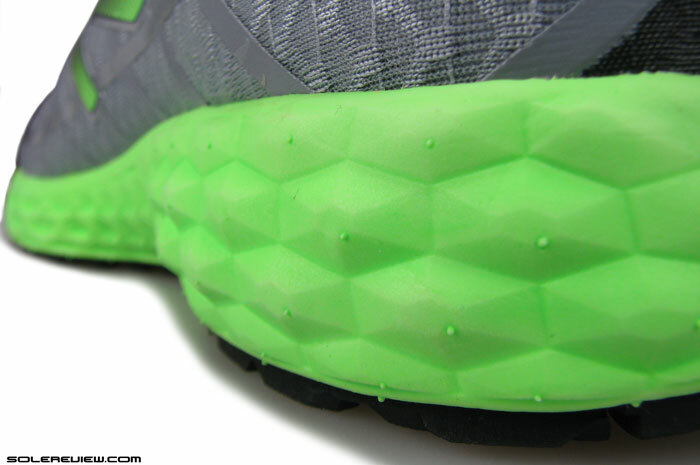 The outsole lug design has been given a refresh, the shapes going from regular hexagons to elongated hexagons. The forefoot has larger rubber lugs instead of smaller nobs of the 980. The traction is great from the softer rubber, which was true for the 980 too. If anything, the Boracay forefoot feels slightly tougher to bend, as you have to go through bigger lugs in place of spaced out hexagons. 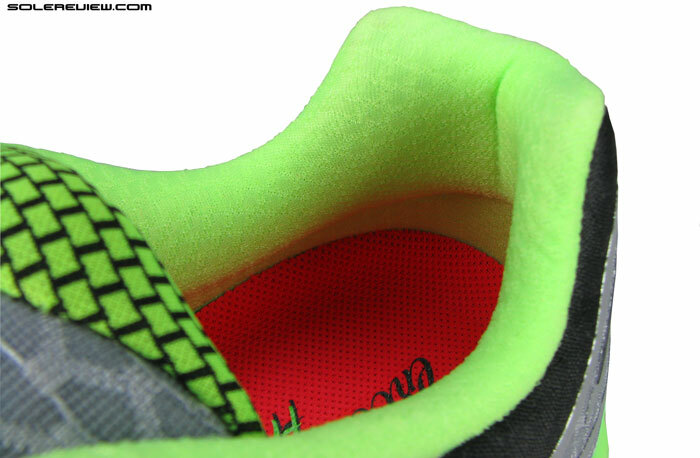 The outsole waist in the center is now broader, increasing the contact patch under the midfoot. The 980 had a sharp inwards scoop on the medial side, which is now (relatively) filled out in the Boracay. These are small changes, and very hard to tell during usage. 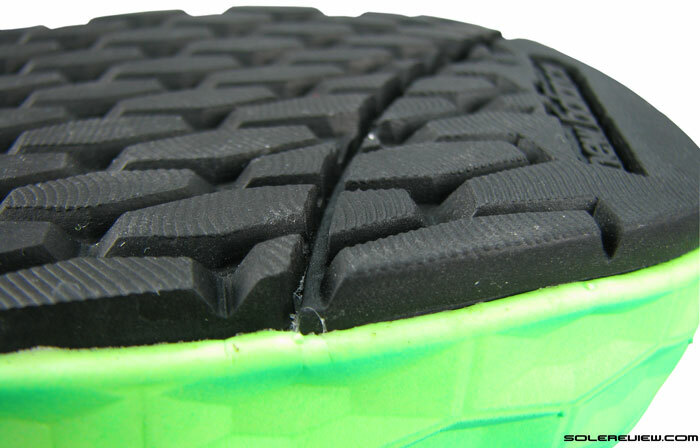 Heel area uses a harder type of rubber in the crash pad – what seems like a molded groove from afar is actually not so. The crash pad and rest of the outsole are two different components, allowing the heel edge to splay out on footstrike. We initially were under the impression (based on the Zante) that the durability might be an issue, but a few months have passed since the Zante review, and the Zante’s similar outsole hasn’t seen much wear despite being one of solereview’s pick for frequent wear. We have reasons to believe that a softer midsole helps that, and also the fact that these outsoles don’t have aggressive ‘come-and-get-me’ lugs sticking out, a la Ultra Boost. And how does the Boracay ride? Just great – the way the shoe glides down the asphalt is impressive. The beauty of a single density midsole design is that the transitions come consistent throughout heel to forefoot, and the other way around. There’s a certain linearity of compression which feels non-distracting, and that is the hallmark of a great shoe. Building cadence also comes naturally on the Boracay, and that’s another brownie point for the shoe. The rear and front of the shoe does not feel like two distinct halves somehow managing to make it work. The Boracay design brings uniformity to the ride, and somehow everything feels like parts of a well oiled machine. A lot of credit also goes to the outsole design, which goes back to the basics by being a plain old sheet of rubber with uninterrupted contact patch. No ridges, plastic shanks or oceans to cross over, just hexagonally shaped minions doing your bidding. Cushioned this shoe might be, but it doesn’t score great on responsiveness. The Zante did better on that front, but there’s no taking away the fact that the Boracay has a quality of cushioning which feels well rounded and polished for the most part. And that is why we said earlier that these two shoes make for a great pairing – similar in some ways and different in others. If you are considering a lightweight daily trainer, the Boracay should be on your list. It’s got a 4 mm drop, so that’s the only thing some 10 mm regulars need to watch out for. As far as everything else is concerned, the sun shines bright on the white sand beaches of Boracay. 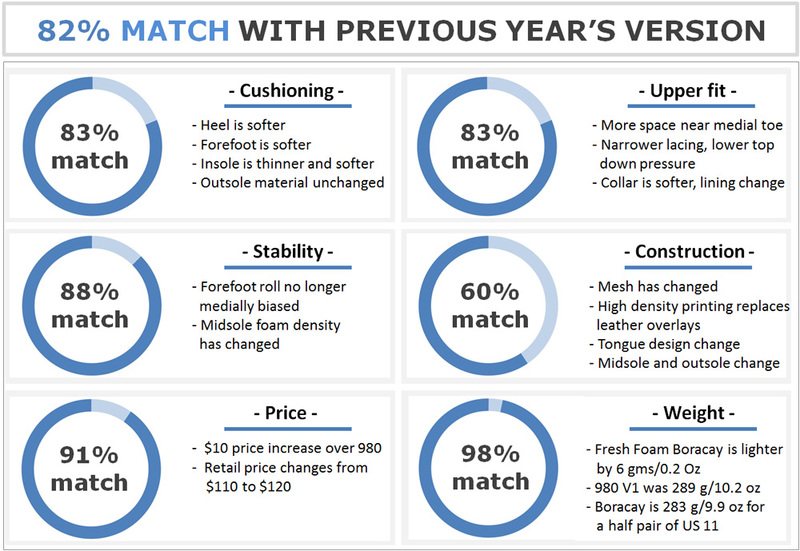 Looking to upgrade your old Fresh Foam 980 to the latest version, but not sure how the 2015 model compares? We can help here. The following infographic is a ready-reckoner for what changes you might expect in the new model vs. old. To make this more fun, we’ve put in a system of percentage match, which calculates a weighted average for a set of attributes. If you were looking for a good daily trainer that could handle intervals, tempo runs and the occasional slower recovery run. That also provided a firm, cushioned but still responsive ride, would you prefer the Zante, boracay, or ua Gemini? The Zante that would be. I continue to be impressed by your reviews here. This is quickly becoming one of my favorite websites. Really well done! As I’ve mentioned in some of my other comments, I’m having a hard time finding a replacement for the Brook Pureflow and Saucony Kinvara. I need a low heel to toe drop lightweight trainer with soft cushion, but still fast and responsive. Something definitely softer than the Kinvara, but as fast. I was hoping one of the new Asics 33 models could fill that void, but now that I’ve read this, I’m very interested in trying both the Boracay and Zante. They sound like they might be what I’m looking for. The Zante could fill in that gap, so worth trying them out. The newer 33 series are all soft but not very responsive (first impressions) so have a feeling that they won’t cut it as speedsters. Hi there, i hope you don´t mind that i join the discussion. I own and love both, the Zante and the Kinvara. I agree that the Zante is definitely worth a try. But i´m not sure if the Zante is definitely softer than the Kinvara (please have in mind that the perception of cushioning is highly individual…). In my opinion the Zante feels slightly firmer than the Kinvara or at least similar. I think this is mainly due to the slightly lower stack height and less foam underneath. Having said that, the cushioning of the Zante is for my taste just right, not too soft and not too firm, adequately cushioned for a performance lightweight trainer. Maybe the new Nike Lunartempo could be an alternative. I did an hour long test run in the Lunartempo and the cushioning felt definitely softer (with some squish) than the Zante and the Kinvara, while still being responsive. They are flexible and very lightweight too. The only dealbreaker for me was the drop with 8mm, although this is not a big issue in this case, because the soft cushioning should provide some sink in. Back then i chose the Zante which has just all ingredients i love. Netherless, the Lunartempo had the softest cushioning compared to the Zante and the Kinvara. Hope that helps! I actually love the way the Kinvara 5 fits, but the firm cushioning seems to pound my knees after a while. I enjoy a softer cushioning, like found in the Brooks Pure line, but that will still allow me to pile on the miles while maintaining a quicker pace (6:30-7:00 min/mile). I’m hoping I can find both the Zante and Boracay locally so I can give them a try. I’d be open to trying the Lunartempo, but like you mentioned, the higher heel to toe drop will probably be a deal breaker for me. I seem to do best in a 4mm drop. I think, beside the 8mm drop, the Lunartempo could definitely meet your demands with regard to soft cushioning. I found it quite remarkable that such a lightweight shoe (lighter than the Zante or Kinvara) had such a soft cushioned feel, while still being fast and responsive (for a performance trainer, not a racing flat). They are definitely capable for your pace range. It´s funny, the cushioning reminded me a bit of a Brooks Pureconnect 4, soft feeling with a bit squish (the Pureflow is too soft for me). In the end the Lunartempo made me curious for trying out the Lunaracer one day, so they could be an alternative too? The good thing for us low drop lovers is, that they have 5 or 6mm drop! I think the Lunaracer is basically a stripped down Lunartempo (the midsoles seem to be very identical, the Nike foam feels definitely soft), not a radical racing flat for sheer speedwork, but a comfortable one that is also suitable for daily training (at least for me). Good luck for the Zante (oh i love them!) and the Boracay, which is on my list too. The NB fresh foam lines runs smooth like butter! I had the opportunity to try on the Zante last night. Unfortunately, they didn’t have the Boracay in stock, but they did have the old version of the 980. Compared to the Kinvara 5, the Zante is definitely a softer ride, but not by alot. It might have to do with how the Zante fit and performed. It was a really comfortable, fast and snappy shoe in my opinion. I was worried I wouldn’t like the 6mm drop, but I honestly couldn’t tell and think it might play into how quick the shoe felt. I could definitely see myself wearing it. I haven’t been this excited about a shoe since I first tried the Pureflow 3. I really want to give the Boracay a shot first to see if the cushion is a little better than the Zante. I tried on the 980 version 1 and didn’t like it at all. It felt clunky and firm. I definitely liked the Zante more. If the new Boracay is like the Zante but with a bit more cushion, I’d be all over it. The Zante actually has a more responsive feel than the Boracay. If we had to play favorites, then the Zante would get all the love. The Lunaracer is pretty much the the same shoe as the Lunartempo. Maybe a tad more narrow and bit less plush, but “under foot” you won’t feel much difference. Got them both and have been racing all distances and training in the Lunaracer for the last 3 years. Some might think its a bit too soft (less ground contact) and narrow, but the amount weight/cushion ratio is just unbelievable. Only the Hoka Clifton can compete in that field. However, the best all round shoe I’ve ever got must be the Zante. Perfect balanced shoe imo and I think it could also be a great long distance racing shoe (haven’t tried that yet). Thanks for the info! Yes, the grade of quite soft yet responsive cushioning in a very lightweight package is a rare combination. I think i will include the Lunaracer or Tempo in my rotation. I am more into semi-firmer shoes with lower drops, but i also appreciate to mix things up. Totally agree, the Zante is a such a fine and versatile shoe! A sound choice for all types of daily training and long distance racing, in my opinion. I recently got the Nike Lunaracer +3 and i am quite happy with it: fairly good cushioned yet responsive for such a lightweight shoe. Right now my favourite easy and long run shoe (funny if one considers that the lunaracer is billed as a racer/trainer). Thanks for the high quality review! I owned a pair of 980v1 and the toe box destroyed my pinky toe. It seems that NB has given us a bit wider toe box this time around. Also, how do you think the Boracay stacks up against the Adidas energy boost? You should notice the toe box difference on the Boracay, in a good way – the smaller toe face is definitely more spacious. The Boracay and Energy Boost differ from each other in a number of ways. The Boost has a softer ride, and a much, much snugger fit. Boracay has a firmer ride, lower drop and the upper fit is far more relaxed. Won’t say that one is better over other, as both shoes fill different niches. Thanks for the input. I agree that the Boost has a softer ride and a much tighter fit due to the sock like “tech fit” uppers.. Having run in and enjoyed both I am on the fence as to which one to get next. Currently, I race in the the 1400v2, fast days I find myself reaching for the 890v4 and for long runs I wear the energy boost which replaced the original 980s for me. Looking forward to your review of the ultra boost! Interesting rotation. We’re looking forward to reviewing the 1400 v3 and 890 V5 sometime in May. Ultra Boost review is underway, publishing time depends on the final photograph(s) post processing and other details. We will review the 890 in May, so look forward to your thoughts before that! Thanks! You could try the adidas Supernova Glide Boost, Nike Pegasus 31, Under Armour Speedform Gemini. Did not recommend the Boracay because of its 4mm heel to toe drop, which could stress your Achilles and Calves if not used to. How does this shoe compare to the Pegasus? I really liked the Pegasus 29 and 30 versus the current 31. Looking for a shoe with the 29 and 30 characteristics. The Peg 31 got a lower drop. The 29 & 30 had a 12. While the 31 has a 10 and is also a bit lighter compared to the previous two. The 31 will feel firmer in both the heel and the forefoot. In short, the 31 is lighter, more flexible, faster and more breathable. Now for the Fresh Foam. You get a 4 drop and I would say a very similar ride compared to the Pegasus 31. The Boracay rides firmer than the Pegasus 29/30, and with a more snugger fit and shallowe toe box. The heel to toe drop for the Boracay is much lower at 4mm so it might stretch your calves/achilles if you’re not used to lower drops. How about fit trying the New Balance 1080 V5 at the local running store? Not the same price band ($40 expensive), but parts of the shoe feel similar. After having such good results and running more than 700k in my NB890v3 I was inclined to stay with NB, so after reading your review I ran out and purchased the Boracay here in Buenos Aires. So far I ran two 10k’s and they feel a lot more smoother than my Adidas Boston Boost which I also own and will only use for speedwork and races. I weigh 70kgs and will aim to run at 5’00-5’20 per km in these, so far they feel great and I will be looking forward to log in more relaxed runs in them. Keep up the goog work, with all of these excellent reviews which help out when needing to change shoes! Thank you for the feedback! Both the Boston and Boracay are great shoes, but like you said, are better utlilized for different occasions. Have you tried the Zante? Another great shoe which can be used to fast training runs. The Boston is a better race shoe, though. you could try the Under Armour Speedform Gemini or the Saucony Triumph ISO. Plenty of cushioning, and supportive too! We can’t think of a model which matches the Transcend – that shoe has a pretty unique ride and behavior. When is the Ultra boost coming out, the wait has been too long now. I thought it should have been out 2 days ago, what is taking so long. It will be published when it is ready, not before. Please do not post off-topic comments – this has nothing to do with the Boracay review. Setting aside the fact that the comment was phrased rather rudely, it’s a fair question. While this wouldn’t be the place to post it under normal circumstances, there’s no place to ask it in the absence of the upcoming reviews section, which went offline yesterday (and if I recall correctly, someone from the site did mention that there was about 48 hours worth of proofing to be done before publication). At any rate, I’m guessing that the Ultra Boost was plagued by issues similar to those the Tempo suffered from. With two of those monsters in such short succession, I understand how it would throw the schedule out of whack. An unenviable task to press the reset button, but you’ve got to do it sometimes. Far from it, the Ultra Boost has no issues at all, at least on our pair. It is just such a monster of a review that the whole process is taking far longer than expected. Nothing is more painful than letting loose a review riddled with typos, syntax errors, uncaptioned pictures and missing details. Happy to hear that the Ultra Boost doesn’t have the same manufacturing flaws that crushed the Tempo. As for the upcoming reviews, all good. I understand why you all are doing it. Unfortunate to lose the upcoming review calendar because of people who didn’t know how to use it. I really enjoyed seeing what was coming on the horizon, but totally understood it was written in stone and things could change or be delayed. On the plus side, your reviews are the best I’ve found. “Wasn’t written in stone” 🙂 guess that’s why proofreading takes so long! It might come back, but once there are more hands on deck. Right now hands pretty full with testing/photographing/writing/proofing/site maintenance/comment engagement. Thanks for the offer, but I just went ahead and bought it right now and I am loving it. I can only hope that you have only good things to say about it in the extensive review. Mostly good things, plus a couple of issues 🙂 It is a good buy nevertheless. Thanks for your review! I have both the Zante and Boracay. Honestly, I prefer Zante and love how the landing felt. I feel Boracay is still a tad stiffer than Zante. Nonetheless, I try not to have any favoritism and alternates between the 2 of them. I can’t wait for your review for 890v5 when it’s out. I have worn out my 890v4 and I love it so much. Thanks for the feedback, edibebe! Yes, the Zante feels more responsive, so we have a similar read on the shoe as yours. 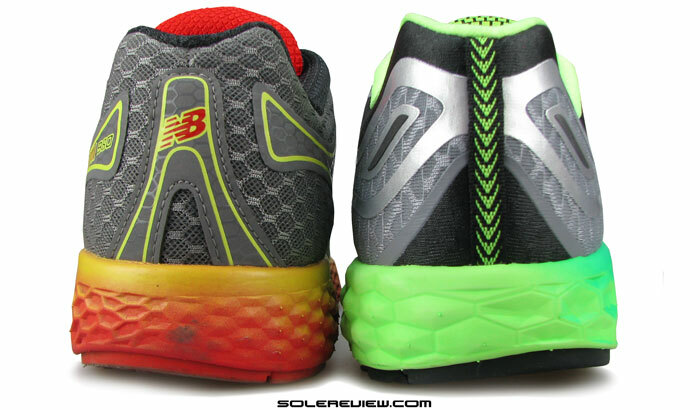 The 890 v5 review should be out in May, hopefully. Just coming to the end of my Glycerin12. Not the best shoe I’ve run in. Made the outside of my left foot hurt for the first 100miles. Money being an issue couldn’t jump ship. Love the sound of the Boracay. Coming from the Glycerin would I expierence any issues. Can’t really say for sure, but with the Boracay’s upper fit being almost fault free, higher chance of things going right for you this time around. The Ghost 7 feels softer under the heel, while the Boracay has this more wider spread feel of cushioning. So depends on how you footstrike. It would be great if you could advice me on whether this could be the next shoe for me (running HM to Marathon distances). I’ve worn several iterations of the Kayano, currently running in the 20 version. I needed the support when I picked up running but this isn’t really the case anymore and I’m looking for lighter (faster), yet still cushioned shoe. I think the main thing that concerns me is difference in heel drop between the Kayano and the Boracay. I would like to move to a smaller drop but maybe the difference between these two is too much. I recently bought the Asics Dc trainer 10 on a whim and had to realise that I shouldn’t attempt to run anything longer than a 10km race in them and also that running regularly in them hurts my knees. Thanks for your help. The Boracay works for HM to FM distances, but if you’re concerned about the drop, then the Nike Lunar Tempo is another great option. Supremely lightweight with cushioning to go. Not yet, but the shoe is currently in our rotation. Will try to schedule the review later this month. Im training for a marathon and Im stuck between the Zante and Speedform Gemini. Would one be better than the other for a heavy runner around 215lbs. Which one did you guys prefer or is there another shoe that would work best for me? Right now im running in the pegasus 31’s and i hate the ride it feels stiff to me. You mentioned that the Pegasus felt stiff – are you a forefoot or rearfoot striker? Is soft cushioning important for you? Did two test runs on a treadmill in the shop yesterday and today and I really like the Boracay 2E! I am a heavier runner with midfoot strike. I guess after reading your very good reviews about the zante and the boracay. that the boracay would be the better choice!. Are you agree with that? Yes, the Boracay is better suited for heavier runners than the Zante! I’m a heavy runner (215 lbs), underpronate, midfoot strike, and have wide feet. I normally get the plushiest neutral shoes like Vomero and Nimbus, but am intrigued by the low drop of these shoes. Do you think the mid/forefoot cushioning of the Boracay is equal to shoes like the Vomero and Nimbus? No, the Boracay is firmer than the Vomero and Nimbus. If you want a New Balance which feels similar, then the 1080 V5 is an alternative. Low drop shoes aren’t necessarily better, they just allow (for heel strikers) a greater range of motion for your Achilles/Calf muscle, among other things. Just happened to notice the weight comparison with the 980 of last year. I am not so sure that the Boracay is lighter than the original 980. I have owned both pair of shoes for quite sometime, and I can say with a fair amount of certainty that the Boracay is definitely heavier. Runnersworld measurement also reported the same. Anyways, just got curious – maybe you would want to take a look at the weight measurements again. Thanks for the callout Mohamad, but there is no error here. All our shoes are measured using an industrial grade precision scale. Our control size is a US 11. Can’t speak for how other sources measure their shoes. We got it right the first time, but the shoes were re-weighed after your comment, here’s a snapshot picture below. Note that the left and right Boracay weighed differently (the picture shows the left half pair weighed) so our published weights are always an average. The 980 on the other hand, had similar left and right weights. Thanks for clearing that up. :). One more thing – I rotate my Boracay with a pure connect 2(short runs <10km). I weight around 70kgs and have a forefoot/midfoot strike. Also, most of my runs are usually slow (approx 10km/h average pace). The Zante is a good choice, and even the Nike Lunar Launch (4 mm drop) is worth a try. I’m 5’10 with a shin splints on both of my feet. Any recommendations? Can’t say. A good way to go around this is to see which shoes kept you injury free in the past and use that as a marker. I have used Pegasus 29 in the pass. Then fit try the Pegasus 31 and new Vomero 10 for a start, and see how that goes. I’m 5’3 (130lb) with posterior shin splints in my left foot, now I’m using asics cumulus 16 and adidas supernova glide 6 but sometimes I feel them heavy and like I was running in high heels can you give me any recommendations, please. New Balance Fresh Foam Zante and Boracay, Nike Lunarlaunch. How is the flexibility of the Boracay? Given the full sheet of rubber on the outsole I would imagine it is not very flexible. It is very stiff in the forefoot. Excellent reviews! I can’t run because of joint pain but like to walk at as fast a pace as I can go. Do you have a suggestion for a shoe? Neutral pronator. Thanks! The Glycerin 12 is an option, but alongside we’d recommend you fit try the Nike Vomero 10, New Balance 1080 V5, the Pegasus 31, adidas Supernova Glide 7 Boost. Another way to do this is to base your next purchase based on previous shoes you’ve liked. If not a very old model and still in recent memory, we can think of some matches. Is the New Balance Solar Eclipse the exact same as the regular New Balance Boracy? Yes, except for some superficial upper detailing. Functionally the same in ride plus fit and feel. These sound like my ideal training shoe in many ways, so I ordered a pair and they came in the mail yesterday. I have two other pair of New Balance shoes (including the 1500 v1 based largely on your review – which I love). Both of my other shoes are 11Ds, so I ordered the same in the Boracay. Sadly, they were much too small – my toes were pressing on the end. I think I need to go up a full size, but I do not see that you had the same issue. I am just wondering if you have heard any similar “complaints” about the sizing on the Boracay. Thank you for the feedback, Ben. We’ve haven’t encountered the cramped toe box issue on our pair, nor have we seen relevant comments on solereview. That said, the same model can feel so different depending on the runner – that’s where individual foot anatomy comes to play. I went to the store today and the 11.5 was perfect for me. I am looking forward to getting them out on the road. bought these shoes today. i am a 5 10 170 pound runner and these shoes are perfect. i transitioned over from the pegasus and one thing that i like the most about them is they lay off of blister prone areas of my feet. i know its early, but after testing the new pegasus i could tell they were irritating previous blister spots. good for mid distance running. i approve of the shoes. just wish i could find my old minimus’ that came out in 2011. best shoe ever. any idea where i could find the older versions of that shoe? Thank you for the feedback, Grant. But can’t help on where to find older Minimus models, perhaps some other reader can help here! 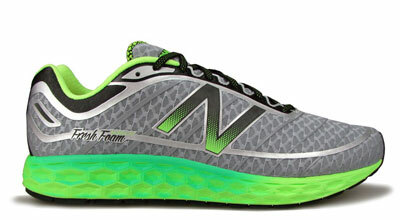 I am a very heavy runner, 275 lbs, and I went to the local running store and came away with the New Balance Fresh Foam Boracay. I took the running on video test and was told I have a mild over pronation. I am training for my first half marathon and don’t want to start off on the wrong foot. I am a complete novice runner and wanted to make sure that these should work for me. Don’t worry about the whole pronation vs shoe thing. If the shoe feels comfortable during runs and fits well, then that’s all there is to it. The only thing we would worry about is the Boracay’s 4mm drop – difference between the heel and toe thickness in millimetres. For some people not used to lower drop shoes (regular ones are 10-12mm), this can cause some soreness along the lower back of your foot. Why don’t you give them a go for a few runs? You could always return the shoe if you encounter any discomfort. Great review as usual! I’m thinking of buying two different pairs of shoes, one for long runs and the other for speedwork and tempos. The Boracays would be for my long runs (no longer than 21km). I’m contemplating the zante or lunartempo for my other shoe, although I’m worried these would be too heavy for track sessions. Then again, in my last light shoes (zoom streak 5s) I got two metatarsal fractures 🙁 But this may also be due to my forefoot strike, growing bones (I’m 17), and the fact that I used my trusty streaks for every run, hence my new shoe rotation plan. Any advice? I’m fairly light, 55kg last time I checked, and I’ll be doing 45+ mpw. Thanks! The Lunar Tempo seems a better alternative. 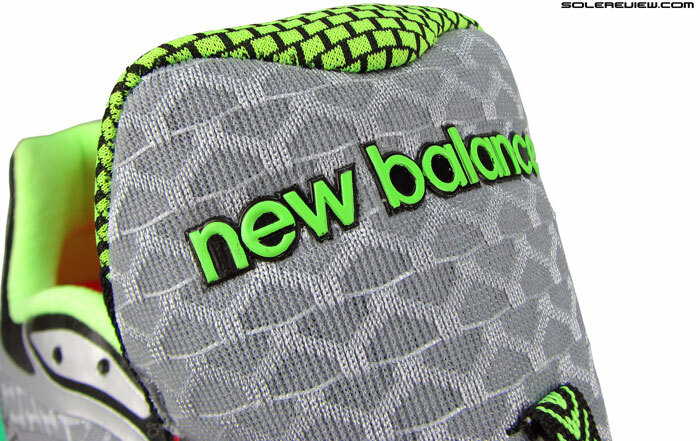 Plenty of cushioning to go underneath, and has that snug fit for track workouts. And why do you think them to be heavy? At 212 gms/7.5 Oz for a US 11, they are actually lighter than the Streak 5. 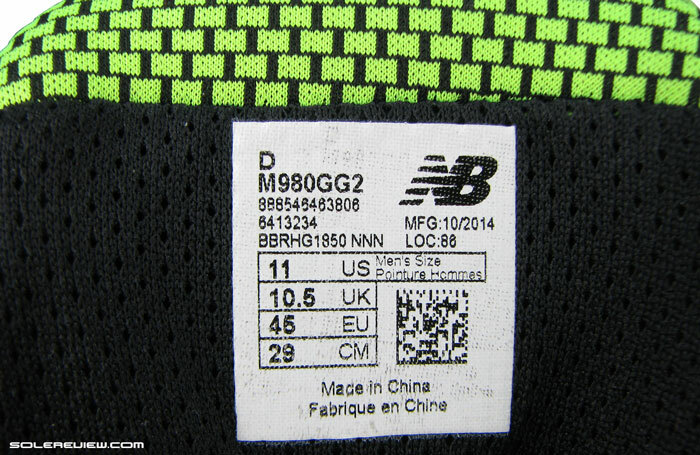 Any plans to review the new balance vazee pace? Thanks! Good to hear! Thanks for being so helpful! You’re welcome, but you need to do us a favor. Please do not post under multiple names, and invalid email addresses – we have been observing this for past several months now. There is no limit on how many unique questions you ask on solereview, so feel free to do under one name/alias. If you’re wary about sharing email addresses (though none of the email addresses are publicly visible, nor will it ever be), create a new one just for sake of using it on comment boards. Most will never realize it, but we reply to every comment after taking into account past comments by the same person wherever applicable – this gradually improves our response quality, and a common username helps with that. How is the durability of this shoe ? In compare with new nike lunar 3 flyknit , whitch one do You recommand ? Not in a position to answer that, since our mileage hasn’t crossed 100 on either of those. If we had to guess, both should close in terms of durability. While the Nike rubber is harder, the Boracay makes up by having a flatter surface, which means better spread of wear. I love these shoes. Thought the review was spot on. After having these for a 2.5 months and about 250miles of usage. They’ve started to wear quickly on the inside heel area and starting to wear the fresh foam sole. I’m not a heavy runner 140 pounds and run on urban roads. Not going to put me off get a new pair shortly. But thought I’d flag and ask if anyone else has noted the quicker than expected wear. Thanks for the feedback and pictures – we don’t have so much mileage on our pair, so in due course someone else should be able to look at this and comment. Thought I’d update on the wear issue i experienced. Spoke to New Balance UK team and after a few emails they agreed to look at the shoes, if I sent them in. Response from their tech team was not an issue standard wear and to be expected for the mileage. However, they kindly sent me a new pair. Great customer service. So really pleased. I suspect these are definitely not going to last above 200 miles so ones to save for race day. While I was waiting I bought the Saucony ride 7, great prices as 8 had landed, based on your excellent review. Must say super impressed. You and the team never fail to just land amazingly spot-on reviews. Any chance you are going to look at the ON Cloud range. The Ride 7 is a great shoe, and even better at the prices you’re getting them at these days. For reasons we’ll describe in the review, we like the Ride 7 over the new Ride 8. On Cloud running shoe reviews will take some time… will get to them once we catch up on all the mainstream brands. I’m looking for a new daily trainer, and just discovered your site. The reviews are fantastic, and I love the detail. I’ve previously run on the Brooks Launch, and loved the shoe but had problems with the upper separating from the sole at the outer edge of the toe box when the shoes were in the 250-350 mile range. I’m 5’9″ and 165 lbs, a neutral pronator, and run 4 times a week for 25 total miles, and several half marathons each year. The new Launch 2 has caused issues in my knees and shins, and it feels like I’m being thrown off of the shoe towards the outer edge. I’ve switched back to a pair of NB 890v4, which are okay, but I’d like something with cushion that can still feel responsive and go at tempo without feeling sluggish. I typically run tempo portions at a 6:30 mile pace and otherwise am in the 7:30 range. From your reviews, it seems like the Boracay and Vomero 10 are good options to try. My forefoot is on the wider side, although I measure and wear D-width, so I’m scared off of the Cliftons. Any other suggestions? We’ve been doing some running lately on the 890 V5, which feels great from a cushioning+support perspective. We don’t have miles on either the Launch or the 890 V4, but would be helpful to know what part of the V4 led to your impression of them being ‘ok’. We see the 890 V5 as a good mix of cushioned ride and support. The only thing is that the shoe is at odds with what it supposed to be – a place between the XX90 and XX00 series – which we see as the disconnect you’re experiencing. I hope you don´t mind this discussion. Yes, it´s a good description that the 890 is at odds with what it supposed to be. At least there are some people, like Loscy or me, who have odd feelings about the shoe (890 v4) in terms of responsiveness or running efficiency, which is by the way normal due to different matters of taste/preference. My expectations towards the 890 were not in the way like comparing it to shoes like the NB 1400/1600 or the Fresh Foam line, different categories and approaches. The odd thing for me was that the 890 has been so far the only shoe that i found really hard to run in (a feeling like running with rubber legs, causing the impression of weakness and fatigue). I felt more nimble and way more effortless in other (good) cushioned shoes (e.g. Nike Pegasus or Brooks Ghost) or even very flexible ones (Nike Free Series), not only racers or fast trainers. I guess a neuro-muscular aspect of how one perceives a shoe plays an important role too (?). Cheers and many regards! We don’t mind this discussion, not at all. The selfish reason why we respond to all questions is that it makes us better reviews, as we get insights from user which we might have missed otherwise. Get what you’re saying about the 890 – it is noticeably softer than the forefoot, and that slows down transition a bit. The fact that the under heel section has a cavity (like 1080 V5) delays the weight loading process. We mentioned this in the 1080 V5 review too. The Nike Free has a good transtion, better than the 890. Relatively firmer midsole and lower profile works in its favor. The reasons for feeling the 890v4 was just ‘ok’ are actually the same ones that Ditsch points out in his response to the thread. On the surface, I really like the idea of the shoe: I like the light weight, the toe box has enough room for my slightly wide forefoot, the cushioning is great, and I find the shoe to be pretty stable, even with the cushioning. But when running in them, they feel oddly sluggish, and I wasn’t quite sure how to describe it best, but Ditsch’s description of “unresponsive and dead” is a good one. I don’t have a lot to compare against, since I’ve only been running consistently for a little over a year, and the only three shoe models I’ve worn in that time are the original Launch, the 890v4, and then the Launch 2. Compared to the 890v4, the Launch felt more alive through the stride – like it was giving you energy instead of taking it away. Without another NB shoe to compare against, I’m not sure if it’s the foam properties or the foam layout, since it is a pod-type structure with cutouts. I have a few other minor gripes with the shoe – even though the toebox is wide enough, and feels fine walking, when I run it rubs blisters on the ends of my 2nd and 3rd toes from the big toe. This hasn’t happened in other shoes, so maybe it’s a shallower toebox? Also, the cutouts in the sole tend to pickup rocks and soft dirt when I run off pavement, either on dirt roads or along levee roads. 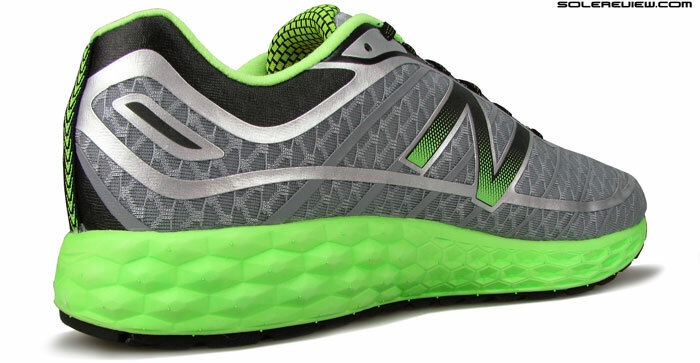 Neither of these problems is preventing me from looking at other NB models for new shoes, but I would like a shoe that avoids the deadness of the sole on the 890v4, which had me searching for shoes with a higher rating in responsiveness, while still having good cushion. I think the Boracay is definitely worth a try, very smooth ride and way more responsive than the 890 v4. The cushioning level should be similar. From my perspective the Boracay has enough protection for long runs, but it doesn´t fall in the overly soft category (i think between “normal” soft/not plush and semi-firm). Not sure about the width. I prefer the fit of Boracay, but i have narrow feet. In my view he Boracay feels slighty more relaxed in mid- and forefoot, while being more on the snug side and not very wide (definitely no Mizuno forefoot). I found the toebox of the 890 v4 also a bit pointy or shallow similar to your description, don´t have these problems with the Boracay. Another shoe that is perhaps one of best combinations of good cushion and responsiveness is the Nike Lunartempo or Lunaracer 3 (different less plush upper than the Lunartempo). They have decent levels of responsiveness while being soft in a very lightweight package, rare combination. The only trade-off could be their narrow/snug fit, so you have to try on first… hope that helps! Great, thanks for the suggestions! It’s nice to hear that the Boracay is way more responsive than the 890v4 from someone who has tried both. I’ll also check out the Lunartempo and Lunaracer 3, as well as the Pure Flow 4, although I agree with you on being hesitant about the pod structure in the midsole. That was a big factor for the initial interest in the Boracay! Interesting, thanks. Except for a contradiction with the 890’s positioning (supposed to be ‘fast’), the shoe is pretty decent. Have you tried the adidas Boston Boost or the Nike Lunar Tempo? I haven’t tried the Boston Boost or the Nike Lunar Tempo. I didn’t see a review of the Lunar Tempo on the site – how does it compare to the Vomero 10? With all the offerings from Nike, it’s pretty hard to keep them straight. I’m heading into my local store this weekend to try out some different options for fit and a run on the store treadmill, so I can see if they have each of those available. I appreciate the feedback on this site, since the salesman gave me some false information (which I’m sure he thought was true) on the gel pads in Asics shoes last time I was in. The Lunar Tempo review is due in a few days. It is more of a fast, Tempo shoe which is incredibly lightweight, in the same league as Lunaracer 3. While cushioned, it is very different from Vomero – much less built up and transition is more efficient. The New Balance equivalent would be the Fresh Foam Zante, but only to a certain extent. I weigh 260 lbs what do you recommend for me? You have to be specific. What kind of things you want in a shoe, the kind of workouts you’ll expect the shoe to perform under, and what’s your shoe history like. I recently purchased an Adidas Glide 6 after going through the reviews( it was more like diligently studying and digestings all the facts and discussions from this excellent site!). and this site really helped me to get a clearer picture on what i needed to buy. The Boracay is nice, but lacks the responsiveness you experienced in the Glide. It also has a tongue edge design which can irritate inside, hence going sock less is a no-go. Instead you could look at the NB Fresh Foam Zante, Nike Lunar Tempo, which are lightweight pacers and differentiated enough from your Glide 7. Thank you for all you thorough reviews, which I regularly read with great interest! I am a female forefoot/midfoot striker with a high arch, weight around 70 kg/154 lbs, with a quite neutral stride – so prefer a neutral shoe with a relatively low drop. I am currently running in the Karhu Flow 3 (love it, but am looking for a shoe with more cushioning, especially for longer runs), the Adidas Glide 6 (trusty, nice cushioning, but prefer lower drop) and the Nike Pegasus 31 (ok forefoot cushioning, but again – looking for a less chunky heal/lower drop and a slightly more exciting shoe). Which shoe would you consider the best for me, the Boracay, the Zante, Saucony Kinvara 6 or the new Nike Lunar Tempo? I am looking for a relatively bouncy shoe that still has good cushioning in the fore-/midfoot, allowing me to both do some intervals, but also slightly longer runs – up to half marathon length. With respect to cushioning, you report that the Boracay and Zante are well cushioned in the forefoot (both 7/10) and whereas runners world reports 25/100 and 28/100 respectively. Do you know why you arrive at such different conclusions? Would this be sufficient cushioning for me – or is it smarter to go for something like the Lunar Tempo or Kinvara 6? Or something completely different? If you already have the Glide and Pegasus, it is unlikely that you will find the Boracay/Zante an improvement on forefoot cushioning, though they might meet your requirements of a lower heel drop. For that reason (drop), LunarTempo should be crossed out too. The Kinvara 6, yes, that is a shoe worth trying, but have you ever considered that the Hoka Clifton to be an alternative? Excellent forefoot cushioning, low heel drop, very responsive, and exciting too. Perhaps not the best shoe for speedy intervals, but perfect for the long haul. Similarly, the Skechers GoRun Ultra 2 also scores on those areas, and we’re hearing great things about the Skechers GoRun Ultra Road (with a Nike Flyknit-ish upper) too. Have no idea about how RW tests their shoes, so can’t comment. Our sensory scorecard is not exactly a score per se (we should change that misleading name), but just an objective assessment of how a shoe feels. It evolves with each review, and every shoe’s sensory scorecard result is relative to all the shoes reviewed before it. Thank you, this is very helpful! I really appreciate that you take the time to respond to comments, even for slightly older reviews. I am not necessarily looking for more cushioning than the Pegasus and Glide and might be happy with a little less, but I would definitely like a little more than the Karhu. You are right that the Nike has too much of a drop – somehow I managed to overlook that, and your suggestions, Hoka Clifton and the Skechers GoRun Ultra 2, look very exciting. I am a little curious how the thick sole will feel, especially uphill, but given how light they are they are definitely worth trying out. Thanks also for the information on relative scoring of cushioning. Given your thoroughness and long experience in testing shoes, I have great confidence in your subjective assessment of what a shoe feels like. Of course, a shoe might feel different to different people depending on foot anatomy, muscles and running form, so obviously I understand that one needs to try out if the shoe feels comfortable. Your scoring is nonetheless a great help when I try to identify which shoe models that are worth a closer look. You’re welcome. People spend time writing these questions/comments, so it is fair that we respect that engagement and time spent. So we reply to every question posted here or our social media pages. And answering these questions also makes us better reviewers, that’s for sure. Would be very interested to know how your experience with either the Hoka and GoRun Ultra’s go. They do good on gradients; a lot of trail runners wear Hoka with proven track records of success. Alongside our current rating program, we are currently exploring other ways of measuring different footwear attributes. And hopefully our scoring methodology should evolve too in the future. I’m a forefoot runner, and more used to low to zero drop neutral shoesl. I have Mantras for trail, Zantes for short runs, and Sayonaras for longer runs. My previous attempts for 21Ks were hampered by issues not shoe related (ie. breathing, bonking, not shoe related I believe) that I ended up doing a lot of walking from 17K onwards. But on the last 21K event, I thought of using my Zantes as I was getting good results with it for 10Ks. Was doing fine with a consistent pace, when my forefoot started hurting and burning from 16K onwards. As I did not want to stop, I tried switching to heel strike. It helped a while, but was awkward as I am not used to the heel-roll-toe-off movement, so lasted me a K then its run walk run walk. Now, I’m looking for a good cushioning shoe, for my forefoot strike, for long runs, 21K onwards, to alternate my Sayonaras. I was initially looking at the ASICS Gel Kayano 21 after hearing a lot from people, then I read about the Gemini, Ride 7, and Boracay on your website with nice reviews. I also realised from your website the Boracay may be the best among the 4 for me due to the low drop while the rest are 8-10mm. Do you have any other recommendations? Since you’re already running in the Sayonara, is there any specific reason why you’re looking for a lower drop shoe? The Boracay is nice, but there are better shoes when it comes to levels of forefoot cushioning. Like the Nike Zoom Vomero 10 – plenty of cushioning firepower up front, and good for those long runs. If you are looking for a lower drop, then nothing beats the Hoka Clifton. I didn’t realise my Sayonara has a 10mm drop, but it feels like a lower drop, and much closer to the ground. When I first shopped for a shoe last year when I started running, the guy had me try something which I felt like I was standing on high heeled platform shoes, so I realized my preference for low drop and stack height. Price is also a factor, and ASICS are so weirdly expensive for some reason. Hoka might well also be, if I do find them here im South East Asia. I’ll try out those Vomero 10, hope they got wide fits as I remember Nikes always having narrow toe boxes. Thanks. True, not all heel drops feel the same. A lot depends on the level of foam compression upon weight loading, and overall design of the shoe. 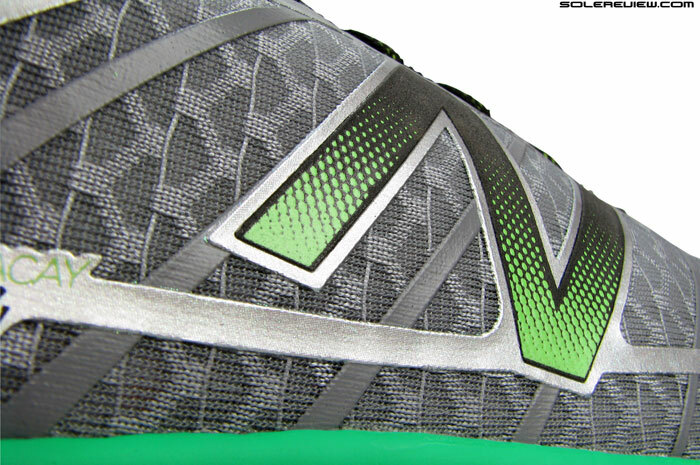 The Vomero 10 has a wider forefoot now, which is new for 2015. Last year’s Vomero had a narrow front in comparison so your observation is spot on. Hoka’s are a good bet, the Clifton is particular. Not sure where you live in SEA, but Escapade sports in HK (not SEA, we know) has it, in case you travel or have someone visiting you from HK. Just wanted to say ‘thanks’ for another exceedingly thorough review. After having a chance to try the Boracay on in 4E width, I was so pleased with the fit — especially with the way that the raised and revised eyelet panels lowered lacing pressure, which has always been a major issue for me — that I bought two pairs, and I’ve been enjoying them enormously. Even at 100kg, I’ve found the cushioning more than adequate, though it could be a little more responsive in the forefoot. Once I get down to the US, I can try out the Nike Vomeros! Just started reading reviews from this site & I love how thorough you guys are! I live close to a N.B. Factory store so I’m waiting for the newer Boracay to come in (980’s go for $50). I don’t run much in general as I used to(ex-x-country & track runner). My long runs are now just 10 miles but I don’t do those too often. I’ve had Pureflow 2’s for quite some time now & I love the low heel height. I enjoy running in lighter shoes without a chunky heel & as mentioned, I don’t put much mileage down during a run. I originally thought that the Boracay is the one for me because I think it matches the heel offset as my Brooks but the Zante’s might work for my purposes. Could you help me out on deciding? It’d be much appreciated. Keep up the great work! If you’re moving on from the PureFlow, the Zante will be an easier transition. The Boracay is a light shoe, but feels somewhat bulky compared to the Zante, and muffles the ground feedback quite a bit. I was in love with Pegasus and bought six pair a year up until three years ago. Now I can’t run in the Pegasus as I end up with very sore knees, whether walking around town or running 13 miles – same result. I have been recycling my old Pegasus for too long and this summer ran two marathons on the old Pegasus 29 shoes as I just can’t find anything else and the old Pegasus, even worn, I can run 13 miles a day 5 days a week. I am a neutral runner, female, moderate heal striker, 5’10”. I have tried the Nimbus and Glycerin – do not like either as they are too soft and feel very heavy to run in. The Vomero is too stiff. I have a pair of the Zante’s, which I like for speed runs, but not for my long mileage and the toe box is too pointy so the outside of my foot gets unhappy. Asics and my foot have never liked one another and the same is true for Adidas – quick blisters on my toes. I have a bit of a high arch so like the shoe with a little more drop. I was thinking of giving the Boracay a try as my marathon training shoe, but your review makes me think something else would be better. Any suggestions on what has a similar build as the Nike Pegasus 28 or 29? With some of the alternatives crossed out, the only shoe which comes to mind is the New Balance 1080 V5. Softness is between the Nimbus and Vomero while being responsive, has a decent 8mm drop, and the weight is near identical to the Pegasus 30 (which has the same midsole as the 29). The upper runs slightly snugger, but we can only speak for the Men’s version. 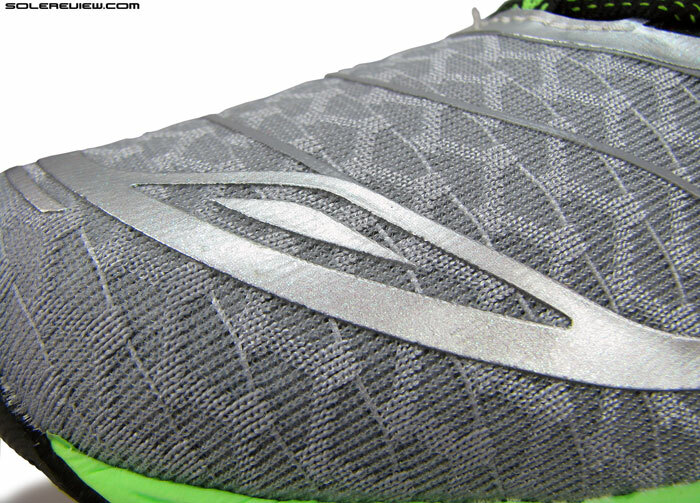 The Saucony Ride 7/8 would be a distant second, only if the 1080 fails to impress. We don’t see the Boracay as a Pegasus 29/30 replacement. Haven’t tested the Launch 2, but appreciate the feedback! Hey guys, great review! Thank you so much for sharing this information.. I never tried a New Balance before and I’m looking around to see which new running shoes to buy.. I’m more of a forefoot/midfoot striker and I’ve recently discovered the joys of running in a low heel drop shoe.. I also mildly pronate.. Enough to give me medial tibialis pain in neutral shoes but not enough to be going for support shoes.. I found the right balance wearing superfeet low profile feet but I worry that this might affect the heel drop.. I’ve recently been very happy running in a pair of Kinvara 5 but i’m looking for something with a more comfortable fit or even some more cushioning.. What are your thought on the NB Borocay or Zante with superfeet insoles.. 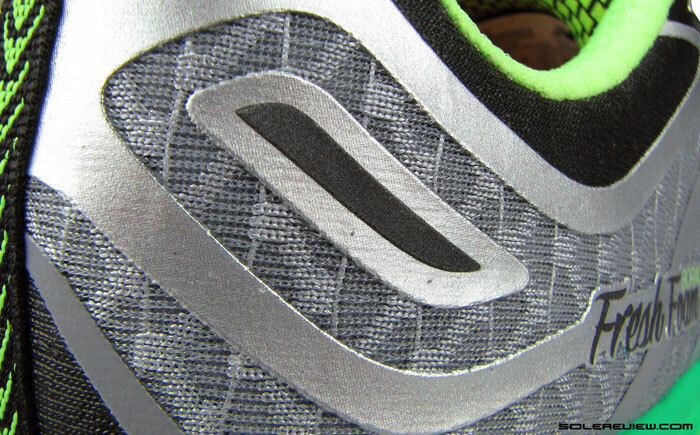 I was also checking out the Saucony Cortana 4 which seems to be a more cushioned version of Kinvara 5? What do you suggest? thank you for the comment! But we can’t be of much help, because we have no idea how the Boracay and Zante behave with superfeet insoles. Haven’t tested the Cortana , so don’t have an opinion on those either. The after-market insole should affect the heel drop much – unless there is a substantial variance between the heel and forefoot thickness. And for whatever you think it is worth, the NB Boracay has a better fit and a little more cushioning than the Kinvara. Your reviews helped me out tremendously on narrowing down a pair of shoes to start getting back into shape in. How would you compare these to Vomero 10s? I’m a little on the heavier side and have wide feet (2E-4E) but I hate bulky shoes. These two models seem like they offer the cushioning I need with minimal bulk. Or maybe even compared to Glycerin 13s? The Vomero 10 is softer and more responsive than the Boracay due to the way the midsole is constructed. The Boracay on the other hand, has an advantage over the Vomero with its lighter weight, and better upper fit. That said, the Vomero’s roomy upper is a better bet for wider feet. Summary: Vomero = softer/responsive ride, wide forefoot but loose heel, Boracay = lighter, firmer and snugger upper. Ryan, you should try the Hoka Constant. im running in adidas eneryg boost 2 and asics cumulush 16. im havy runner.107kg,192cm,what about cushining in oposit those 2? Markoleti, these are pretty firm compared to the Energy Boost and Cumulus. tnx for answering. what would you recommend for me? You could stick to the Energy Boost. There is a 3.0 available now. How does the cushioning compare to let us say the Adidas Adios Boost 2.0? The Energy Boost is waaaay softer than the adios. I should have been clearer. My bad. I meant Adiot Boost 2.0 compared to the NB Fresh Foam Boracay. Not as soft as EB, yet more cushioning depth than the adios. I am going on a six day 128.3 mile walk on asphalt and I have been searching for a shoe that will be the best choice for this type of walk. Any suggestions? We’d say that something of the New Balance’s walking shoe line might be suitable, but since we don’t review walking shoes, we don’t have specific recommendations. If you want a running shoe rec, then we’d say the Brooks Glycerin 13, the Asics Gel Nimbus 17 or the Nike Pegasus 31. I feel like this shoe would be a perfect everyday trainer with an 6-8mm drop, and that the Zante should be the shoe in the Fresh Foam line with the 4mm drop given its speed orientation. I’ve been really interested in trying out the Boracay, but it’s slightly confusing (and worrisome) that my lowest-drop shoe would be my “intergalactic mileage” option. My current rotation consists of two 8mm drops (Hurricane ISO and 1260v4, with the Hurricane set to be phased out soon) and a 6mm drop (1500 v1, aka my favorite shoe EVER). Should I be worried, or am I overthinking this? You might want to consider the Fresh Foam 1080 V6 then. 8 mm drop, and plenty of foam for daily runs. Thanks for the suggestion! 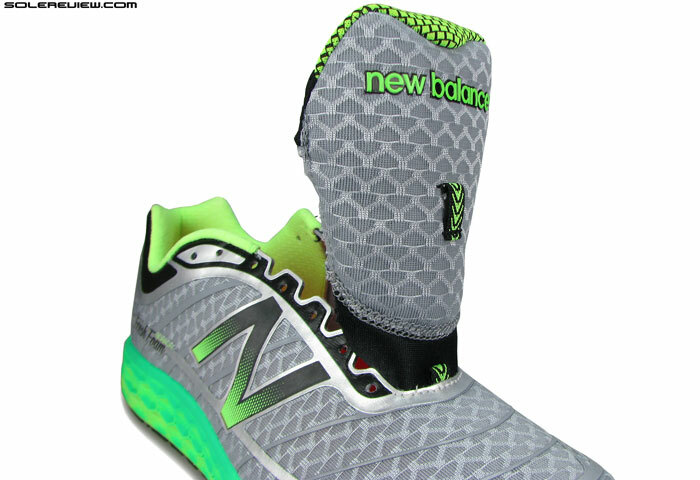 The problem with the 1080v6 is that NB stitched a midfoot cage overlay onto the upper this year. I’ve had blistering and hotspot issues with the Saucony Hurricane ISO’s similar cage structure, and my medial midfoot tends to appreciate a cleaner, more seamless upper, so I’m hesitant to go with the 1080 as a result. So I guess I’m back to the original question: Boracay as a preferred daily workhorse to the Zante (or Zante v2), despite the fact that it’ll be the lowest-dropped shoe in my stable? Got it. The Boracay still makes sense, though not entirely sure how you’ll get along with the heel drop. Went with the Zante V.2, and really, REALLY enjoyed my first two short runs in them (5 and 4 miles, respectively). The fresh foam midsole has a great dual character. Plodding along at a slow pace the midsole has a cushy, soft feeling to it. At faster speeds it firms up nicely and it becomes tighter and much more responsive. It reminds me of a fancy sports car’s multi-mode suspension. The upper fits fantastically as well. We got our hands on the Zante V2 recently. The upper is an improvement for sure. The cushioning behavior you described makes sense for soft, low stack midsoles. At slower speeds, you get the compression benefit, while at high speeds the maximum (and quick) deformation results in the firmer ride.